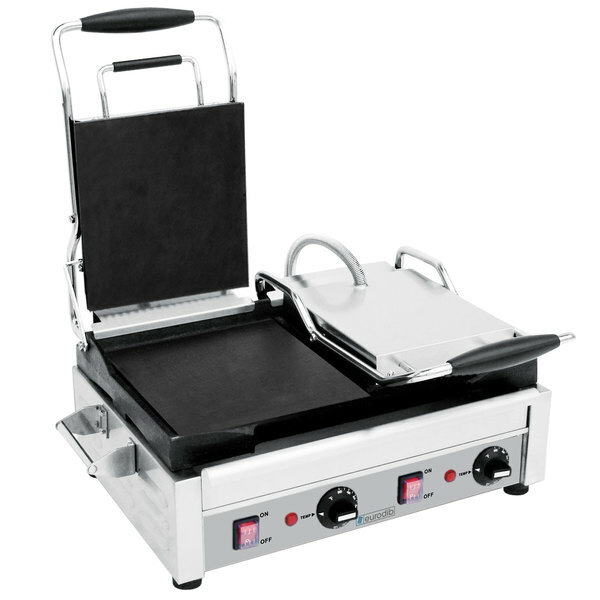 Cook up an endless variety of sandwiches and entrees at your concession stand, deli, or sandwich shop with this versatile Eurodib SFE02360 panini grill! Thanks to a dual upper plate configuration and independently controlled cook zones, this unit allows you to quickly prepare a combination of flatbread or Reuben sandwiches, wraps, chicken, and veggies. Or, during non-peak hours, you can use just one zone to save on energy consumption. No matter what you're making, the grill's self-balancing upper plate automatically adjusts to your food's thickness so you don't have to worry about smashed or unsightly product that may occur with fixed-hinge units. For complete control over your cooking process, this unit features precise thermostatic controls that are adjustable up to 572 degrees Fahrenheit. The smooth cast iron plates not only retain heat better than comparable aluminum plates, but are also non-stick so you can easily remove product and clean up in a snap at day's end! A removable grease drawer and rugged stainless steel body also help expedite cleaning, ensuring your panini grill will maintain its sleek appearance for as long as possible. This unit requires a 220V electrical connection. Height (Lid Closed): 9 6/16"
Cooking Area: 9 1/4" x 17"